Smith’s is very proud to announce that Silent Fin Heating Edge has won the CIPHEX West 2016 award for best new product in the Hydronic Heating Category. CIPHEX West is Western Canada’s biggest trade show and conference for HVACR, plumbing & water treatment. There were 61 new products, including many that were launched at the show. 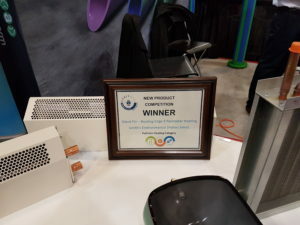 To be a finalist, each product must demonstrate innovation in terms of utilization for function and offer a variety of benefits including to the industry members who sell it, install or specify the products, and ultimately, to the end user. On November 2, 2016, a jury of industry expects awarded Silent Fin Heating Edge the winner in Hydronic Heating category. We’d like the thank CIPHEX for this prestigious award.